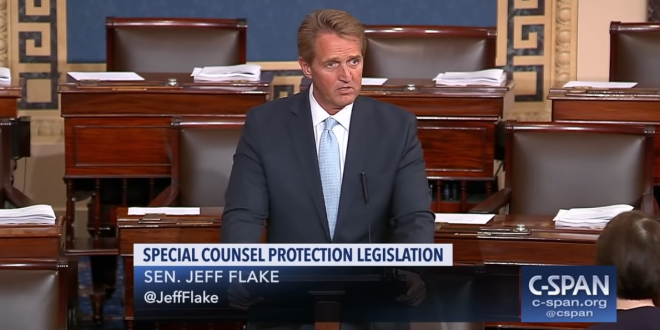 Flake: I'll Block Judges Until Mueller Protection Vote - Joe.My.God. Senate Majority Leader Mitch McConnell, R-Ky., is blocking a bipartisan effort to protect special counsel Robert Mueller’s investigation of the Russia attack on the 2016 presidential election — prompting retiring Sen. Jeff Flake, R-Ariz., to pledge he will block progress on confirming judicial nominees. I have informed the Majority Leader that I will not vote to advance any of the 21 judicial nominees pending in the Judiciary Committee, or vote to confirm the 32 judges awaiting action on the floor, until the Mueller protection bill is brought to the full Senate for a vote.